Looking like a spider's web swirled into a spiral, the galaxy IC 342 presents its delicate pattern of dust in this image from NASA's Spitzer Space Telescope. Seen in infrared light, the faint starlight gives way to the glowing bright patterns of dust found throughout the galaxy's disk. 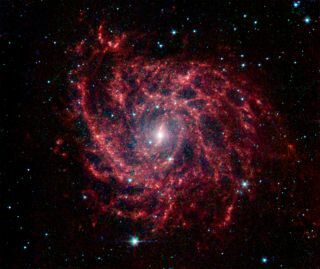 A spiral galaxy's starlight and delicate pattern of dust evoke a bright, swirling spider web in space in a newly released image from NASA's Spitzer Space Telescope. Captured in infrared light, the galaxy IC 342's faint starlight gives way to the brightly glowing dust found throughout the galaxy's disk. The spider web-like galaxy is located about 10 million light-years away — relatively close in the cosmic scheme of things — but from this vantage point, the galaxy is directly behind the disk of our own Milky Way. The spiral galaxy appears nearly face-on, which gives a clear view of the structure of its disk. IC 342 has a low surface brightness compared to other spiral galaxies, indicating a lower density of stars, which appear as a blue haze in the image. The blue and white dots sprinkled throughout the wispy spirals are stars much closer to us, within our own Milky Way. New stars are forming within IC 342's disk. In fact, the center of the galaxy is actually home to an enormous burst of star formation. To either side of the center, a small bar of dust and gas is helping to fuel the new stars, researchers said. NASA's Spitzer Space Telescope was launched in 2003 and is designed to detect infrared radiation emanating from cosmic objects, including faraway galaxies, black holes and even comets in our own solar system.